Tickets bought online are non-refundable, but they can be transferred to a different person. Changes in date and time are welcome, providing 72 hours notice is given and we have space in our schedule. Leap of Faith tickets may be available on the day. However, booking in advance is strongly recommended as spaces are limited. Tickets are sent via email to the address you provide when booking. We cannot permit children under the age of four, pregnant women, people over 21 stone, with heart complaints or spinal injuries to participate in our activities. 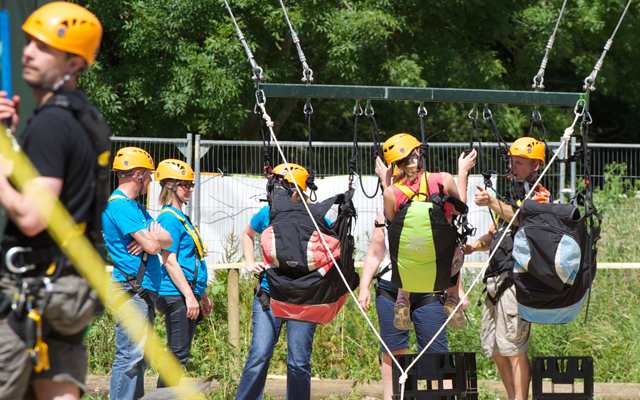 Leap of Faith is open every week, on bank holidays and during the school holidays. Birthday parties, school groups and corporate activities can be booked outside of these times by prior arrangement. For any questions or queries, contact Chris on 01174285602 or on info@leapoffaith.co.uk. To read and sign a disclaimer and risk acknowledgement before commencing any activities. This will be available or provided when guests arrive. The risk assessment should be completed and handed to the instructor at the beginning of the session. To wear the safety equipment provided and fitted by an instructor and use the equipment in the manner that they are instructed to during their safety training. To be over the age of four and under the weight limit of 21 stone. Due to the physically demanding nature of the activity, all participants must be reasonably fit and healthy. We recommend that customers with medical concerns such as but not limited to: back problems, heart conditions or pregnancy do not undertake this activity. Participants will be required to certify that they do not suffer from any medical condition that would make it more likely that they would be involved in any accident that would result in injury to themselves or others. To use reasonable endeavours to ensure that Guests’ bookings commence on time. To reserve the right to refuse admittance to the activities or to remove a participant from the activities should it be deemed necessary to do so, including but not limited to: participants not completing a disclaimer, not complying with safety instructions. No refunds or compensation will be payable by Leap of Faith in the event that any participant is not permitted to or decides not to, undertake or complete the activity course. There is a no refund policy with all tickets purchased unless Leap of Faith or Wild Place Project is closed due to unforeseen circumstances.